One day you might be using your computer, and after installing a piece software or you are recovering and trying to cleanup the system from a malware attack, there might be a few issues which stop the computer running properly. One of the common problems which malicious software or a faulty install can leave behind is the system not being able to run any programs, and you receive an error when you try to launch a program such as your web browser or Word etc. Because these errors can stop you running tools such as Regedit, Task Manager and even the Command Prompt as they’re all executable .EXE files, fixing it is quite often not as easy as it might seem. Sometimes other associations may also have been affected, so you may not be able to import something like a .REG file into the registry to fix it. Obviously, the first and most important file extension to fix is the .EXE extension. Once this sorted and working, you are able to run the registry editor and other tools to start repairing other broken extensions. Here’s a selection of ways for fixing .EXE extension issue and get your programs launching properly again. If you are trying any of the fixes below that require the use of the Command Prompt, you might not be able to get to it because you would obviously have to type cmd.exe into a Run dialog or run the cmd.exe shortcut from the Accessories Start menu. There is however, a simple trick to get around this without needing to do anything like renaming files in the Windows folder. Follow the instructions below. 1. Press Ctrl+Shift+Esc simultaneously to bring up the Windows Task Manager. 2. XP users can skip to step 3. The extra step needed for Vista, 7 and 8 is to run an elevated Command prompt or you will receive an “Access denied” message when typing in the commands. 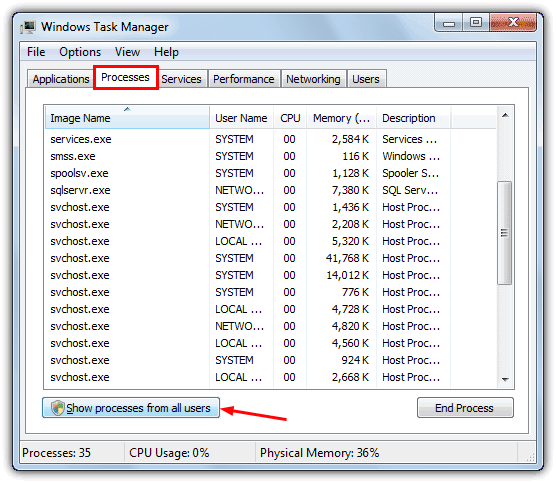 In Task Manager click the Processes tab, then click on the “Show processes from all users” button at the bottom. If you don’t have the button and only a tick box you should already have administrator rights. 3. Click the File menu and move the mouse cursor over to New Task (Run…), but DON’T click it yet. 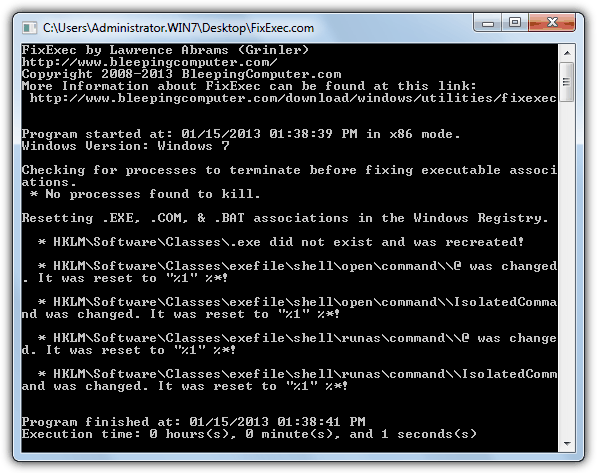 Now press and hold the Ctrl key while left clicking on New Task (Run…) to bring up the Command Prompt. Tip: The method of using Ctrl+Shift+Esc to access Task Manager is also quite helpful when you have a rogue antivirus program on the system that launches itself every time you try to run an executable. Running a program via the New Task (Run…) option will let you run an executable file even though the rogue is intercepting file executions. 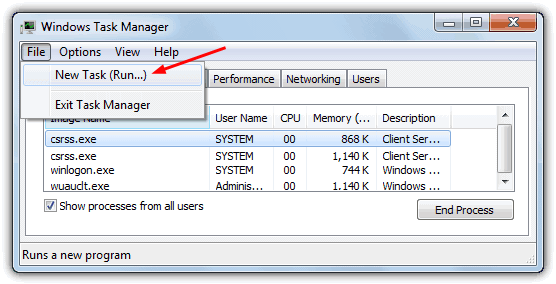 As Task Manager is also usable, any suspicious or known processes can be killed and then one of the below files to restore the executable file type or a malware removal tool can be used. If the EXE association is not too badly damaged, you may be able to repair it by importing the correct values into the registry. Simply download the below file (make sure you right click and select Save As) for your o/s and double click it to import into the registry. Now try out your .EXE files, a reboot won’t be needed to see if it has worked or not. Although it may seem counter intuitive to most people, executable files can still be launched even though the EXE association and file type might be broken. This is because there are other types of executable file such as .COM and .SCR which could still have working associations and therefore files with those extensions will still launch. The files below were created from the .REG files in the previous solution with a handy little tool called Reg2Exe which we’ve written about before that simply turns a .REG file into an executable. There will be no interaction after you run one of these files, simply try an executable .EXE file afterwards. Alternatively, the people over at BleepingComputer have created a utility called FixExec that will fix the .EXE, .BAT and .COM file associations in Windows XP up to Windows 8. It will also terminate any malicious processes found in typical areas where malware might launch from which could try to reset the associations back again to non default. Simply run the tool and if it detects any wrong associations, FixExec will repair them for you. There are separate 32-bit and 64-bit versions available along with pre-named .COM, .PIF and .SCR versions. There are several more solutions for broken file associations on Page 2. This is a life saver. thank u so so so much for this . Thank u so much sir, steps mentioned by you really solved all the problems in a minute. i have just one query now. The file that i just downloaded now to fix reg shall be deleted or kept safe. Will deleting this fix undo the fixes too? Superb! Thank you very much sir. Thank you SO much for this. I messed with the registry editor because one of my .exe files wasn’t opening, and it ended up messing with everything. I thought I was going to have to reinstall Windows or do a system restore. Such a simple fix, and you made it so easy to follow. I absolutely love you. I was being stupid and got some virus trying to download a show. The fixexec program saved my computer and my rear end. Thank you so much. I was in total panic mode as I had to get a lot of work done and suddenly the “.exe” files decided they didn’t want to work anymore! Thank so much for the simple explanation and solution – the problem got fixed instantly . I tried multiple fixes from so many sites, running 32 bit window 7. I tried registry scripts, and Microsoft fix it – I was at my wits end. I tried the unhook inf file. 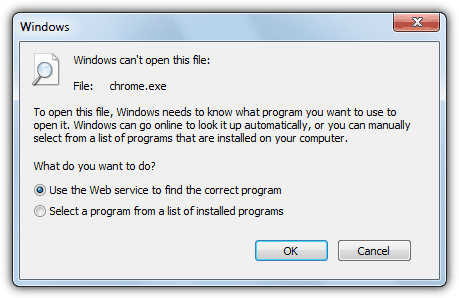 I found a shortcut to a webpage I had, opened the internet that way, got the inf file and right click installed. It was magic. Ray, I don’t care what everyone else says, I say that you’re bordering on a near Saint-like level and I feel truly blessed to have found your site and the .exe fix was an absolute beauty!! 5 different angles to attack the blighter from, all well presented with clear, concise, idiot-proof (as I live and breathe!!) instructions that solved the problem and got me back on my feet and ready for the next disaster that my limited computing prowess will inevitably lead me to. So thanks again Ray, it’s a near certainty I’ll be back here again soon, in a sorry state of disrepair and in need of some of your expertise. Take my word on it folks, it worked for me so I fail to see why you’ll be any different?! I’ll be back, you can bet your house on it!!! Or maybe someone else’s???? Although the issue I had did not get resolved using this method, this did allow me to fix the problem of a virus on my system. You had a step here which allowed me to pull up a disabled antivirus program from a command prompt which was able to remove the problems on my pc. I couldn’t even get to a command prompt till I read this article because none of the exe files on the pc I was working on would start. Good read, and thanks for teaching me a new trick. if anyone is looking for a good software program to repair execution files or corrupted icons Microsoft Fix it 50194 worked perfect for me. Again thank you for this site god bless you. You are the greatest I searched for hours and would do many sites and finally found the information I needed here keep doing what you doing I give you a big thumbs up thank you. Thank you soo much !!!!!!! I delete .lnk out of my computer :D :D and you repairt it !!!! THANKS !! thank you so much for these links, i thought i’d broken my laptop by altering the .exes -.- really saved my bacon thankyou! You are such a good man! Exellent! thank you very much!!!!!!!!! I greatly appreciate your effort into helping others in need. I, myself, had problems associating files. Thank you for this helpful tip, Sir. Thank you so much for the tips to restore my files. You are the best. This is a great tip; thank you! After working over 14 hours trying to figure out how to get this .LNK problem I had no luck. Now with this info I have the regedit.exe working. Thank you so much!! Now I am trying to fix things in the registry. This has always been no mans land for me but I will try. I did find an enormous number of files in CLSID with many digits and alpha characters following next to the file folder. I assume they must all be removed. Raymond, you saved my life! I am on social security and don’t have a lot of money, so when I got the problem of all my .EXE files turned to .LNK, and I couldn’t open anything but My Documents and Internet Explorer, I thought I was going to need to spend a small fortune to get the problem fixed. I looked up and down the web for help, and your’s was the only one that looked promising. So I tried it, step-by-step, just like you said and presto! Works like a charm. After I did it, I was finally able to do a system restore (which I couldn’t do before to save my life), and I’m back like the problem never existed… and I had already arranged for someone to stop by and take a look at it for $100! A hundred bucks I couldn’t afford. You are the greatest. I am going to recommend you to EVERYBODY! Thank you! STUMBLED! Another awesome post, I have learned so much from this blog. That trick to load command prompt from task manager is awesome! One thing: If CMD.exe regedit.exe and taskman.exe are all deleted/modified so they won’t work… Then how would you do it? My hypothesys would be to get a friend to either copy his cmd, regedit, and taskman to a floppy or usb stick and give it to you to boot up in safe mode to copy the file to the correct folder then hit Ctrl+Shift+Esc and hold in ctrl and go to File and select New task then you can do everything stated in the article, but with a different cmd.exe. Good job, Raymond, This is in great help. A very useful info Raymond. Good job.